Owner Honda Motor Co., Ltd.
Suzuka International Racing Course, Suzuka Circuit for short, is a motorsport race track in Ino, Suzuka City, Mie Prefecture, Japan and operated by Mobilityland Corporation, the subsidiary of Honda Motor Co., Ltd.. Designed as a Honda test track in 1962 by John Hugenholtz, Suzuka is one of few circuits in the world to have a figure 8 layout. The track doesn't actually intersect with itself. The back straight passes over the front section by means of an bridge. The circuit can be used in three configurations. The full circuit, the "Suzuka East" and "Suzuka West" configuration. The "East" course is made of the pit straight to the first half of the Dunlop curve (turn 7). It then leads back to the pit straight via a tight right hand turn. The "West" course is made up of the other part of the full circuit, with the pit stop at the straight before the 130R corner. 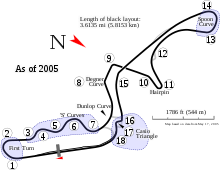 Suzuka is one of the oldest remaining tracks of the Formula One World Championship. It has a long history of races as host of the Japanese Grand Prix. 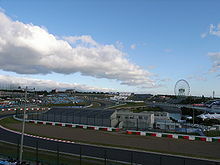 Suzuka was dropped from the Formula One calendar for the 2007 and 2008 seasons in favor of the Toyota-owned Fuji Speedway. Fuji had just been remodeled and the circuit redesigned by Hermann Tilke. Suzuka and Fuji were to alternate hosting the Japanese Grand Prix starting in 2009. In July 2009, Fuji announced that it would no longer be part of the F1 calendar. Suzuka signed a deal to host the Japanese Grand Prix through 2011. The circuit closed for a year to make renovations. They needed to make the track comply with Formula One requirements for 2009. The last major event held on 18 November 2007. The track held a re-opening day on 12 April 2009. Suzuka also hosts other motorsport events including the Suzuka 1000 km endurance race. The Suzuka 1000 km is a round of the Super GT series, and is the only race in that series of that length. Suzuka also hosts the Suzuka 8 Hours for motorcycles, which has been run since 1978. NASCAR organized the NASCAR Thunder 100, a pair of exhibition 100-lap races on the East Circuit. The races were held in 1996 and 1997. The 1.4 miles (2.3 km) layout which using the pit straight and S-corners, before rejoining the main circuit near the Casio Triangle. The cars were from the Sprint Cup Series (then called Winston Cup) and Camping World West Series (then called Winston West). The field was by invitation for the two races, and the field included several Japanese and Australian drivers. The 1996 event was marred by tragedy when pace car driver Elmo Langley died of a heart attack during practice. During qualifying for the 1997 race, rain caused Goodyear to use rain tyres on the Sprint Cup cars. This was the first time in NASCAR's modern era (which started in 1972) that race cars used rain tyres. It was announced on 21 June 2010 that Suzuka Circuit would host the Japan round of the 2011 World Touring Car Championship season instead of the Okayama International Circuit. Following two bad accidents in 2002 and 2003, safety has been a concern at the circuit's 130R corner. 130R is a 130 metres (427 ft) radius turn starting past the Crossover. 130R has been compared to Spa's Eau Rouge. In 2002, Toyota driver Allan McNish suffered a high-speed crash through the bump. The crash sent him through a metal fence. He was not seriously injured. Track officials redesigned the corner. They made it a double-apex (two smaller turns in one corner) section. One apex had a 85 metres (279 ft) radius, and the second had a 340 metres (1,115 ft) radius. This led to a much closer Casio Triangle (chicane), with the chicane becoming a "bus stop" type for motorcycles. Problems continued for the revised section. During the 2003 MotoGP Grand Prix of Japan, the track's first major event since the revisions, MotoGP rider Daijiro Kato was killed when he crashed in the new section, on his way to the braking zone for the Casio Triangle. MotoGP has not returned to Suzuka since the incident. Along with Fuji Speedway, Suzuka Circuit has been featured many video and arcade games. The circuit appears in most F1 games that have been published since 1987. The East Course was featured in NASCAR 98. ↑ "Japanese Grand Prix to alternate between Fuji and Suzuka". formula1.com. Formula One Administration Ltd. 2007-09-08. Retrieved 2010-08-11. ↑ "Fuji Speedway gives up hosting F1". cctv.com. China Central Television. 2009-07-08. Retrieved 2010-08-11. ↑ Bradley, Charles (ed.) (August 2007). "Suzuka to close for a year". Autosport 189 (6): 11. This page was last changed on 17 November 2017, at 12:34.